The most striking characteristic of Brian and Lynne is their versatility. They can offer a variety (mix of Baroque, Classical, Standards, and more). They employ a variety of instruments and ensemble which make their performances refreshing. Every performance is a unique experience. The music programming and instrumentation can be tailored to the client's preference. There is a large musical library to draw from, and requests can be arranged with advanced notice. The high caliber of each performance demonstrates Brian and Lynne's enthusiasm and dedication to providing an atmosphere that will enhance any occasion. Brian and Lynne have a classical trio including flute, clarinet, and cello. With this trio, they perform music from the Baroque and Classical periods as well as lighter fare. Arrangements of special requests can be made with advanced notice. 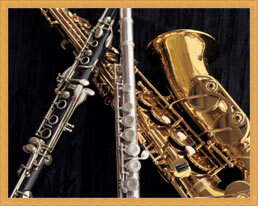 The classical trio performs for weddings, receptions, dinners, and background music to enhance the occasion. Brian and Lynne also have a jazz combo. The jazz combo can consist of Brian on saxophone/flute/clarinet, Lynne on flute/saxophone/vocals, and a keyboard player or full rhythm section of keyboard, bass, and drums. The jazz combo performs for wedding receptions, dinners, restaurants, or other occasions. They can do all instrumental or add vocals from jazz standards to enhance your experience and suit your needs. Brian and Lynne are available for weddings, anniversaries, and any other type of occasion. Please contact them today.